Last month I decided to start buying contact lens and giving it a second chance. I tried wearing contact lens a few years back but some of the lenses I tried were too dry for my eyes or somehow too glaring that I couldn't open my eyes during day time. So there is this online website that sells contact lens. 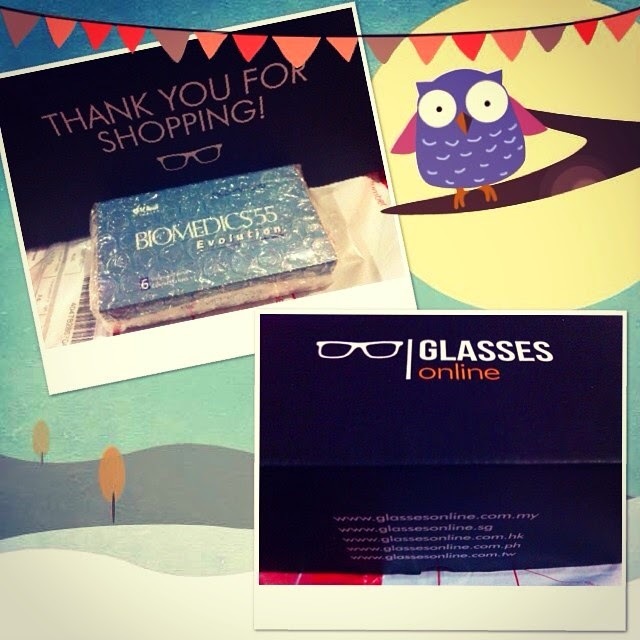 They are original brands that are similar to those sold at the optical shops outside. I came across this brand Biomedics 55. The website is actually selling it rather affordable. There is 6 lenses in a box so if like me, I wear the same power for both eyes, then it would mean 3 months of supply. Surprisingly, the price for 3 months supply of this Biomedics 55 contact lens is only RM50! The website that is selling this is Glassesonline.com.my. You can check out the variety of contact lenses and glasses that they offer. Moving on to the contact lens itself. I have actually tried and tested the lens myself for almost a month now. Surprisingly, this lens is VERY moisturized and when I put them on, I don't feel the lens on my eye. You know how some lenses look super obvious when you put them on and people can obviously see that you are wearing contact lens. For example, there is this brand of lens that is slightly bluish in colour. Where as, for this, you can barely see the lens on your eye! It is VERY VERY comfortable. Only towards the end of the 30 days period that I start feeling the dryness of the lens which is normal as the lens is for a duration of 30 days. Besides the comfort and all, I actually bought this last month when there was an offer. There was actually a discount of 25% off and that makes it ONLY RM37.50! This means only RM12.50 per month! Outside the cheapest I could get from a physical optical shop is probably RM20 per month and that also I need to buy at least 3 pairs. I actually placed my order during Hari Raya season last month and guess what. I placed the order on the 29th of July and on 1st August,I received the package! Super efficient in delivering the lens to customers. On top of that, great packaging! It is wrapped up in bubble wraps that it is very safely kept and they even put it in a shoe-size box! I don't usually write reviews for websites but this one, too good to not write anything about them! Good news is that they are currently having MERDEKA SALES! The same amount of discount as the Raya Sales; 25% off! Just key in GOMERDEKA at the coupon code space! Promotion is until 2nd September! I haven't been updating for 2 months. My last post was the end of June which is so long ago. A lot has happened throughout the two months. July was pretty much so-so. The World Cup ended in July! LOL. I can't really recall but then I looked back at my Dayre and noticed it. Supported Germany from the beginning. For once in my lifetime I was actually dedicated and committed in following all the matches. Thank goodness I graduated and basically had nothing to do everyday. So I had all the energy and time to watch all matches. Besides that, I learnt how to cook porridge. Yes, I know I am 22 years old and I am suppose to know how to cook a proper meal. But this is not the 90s okay! Oh, and July is summer for other countries so all my secondary school friends were back in Malaysia! And a lot of other meet ups as well. Felt so satisfied and loved. Oh and I started working part time at the end of July. Can say one of the most challenging and at the same time worst part time job ever. Challenging because there is no basic pay. Worst because of communication issues. Other than that, my birthday. Hmm.. haven't actually had an actual whole birthday cake YET. LOL. It is almost one month after my birthday and still I am hoping for a cake. Less than 20 people wished me. I guess that is what happens when you grow up? Got ACCA results on the 8th of August. To make things short, I passed one paper and failed one paper. Yes, I failed one paper. It was definitely one of the worst day of my entire life because I have never failed in anything before, especially when it comes to education. To make things worse, because I failed one paper, I can't further my studies in the UK for Masters. I will be in Malaysia and contributing to Malaysia's GDP and economy. No more an Apple user, I am now a XiaoMi user. Changed from iPhone 4 to Redmi Note. The biggest difference is the size of the phone. But overall, I am quite impressed with its battery life. Will do a review post later when I am free. So after receiving my ACCA results, I started applying for jobs. And on 22nd of August, I attended my first formal interview. Will be starting my first job as an Audit Associate on 8th September.